I was made to work hard while my laggard mother sat idle. I cleaned the flues of soot, washed the chamber pot, scrubbed the floors and plucked the hairs off her chin–and all before the sun came up every morning! That is a lot of work for a lazy girl like me. I dreamed of being a Squire’s wife, with dresses of velvet and wool to wear like the fine ladies that brought the flax to spin. But it seemed like a silly dream for a peasant girl. What Squire will marry a peasant? Feeling sorry for myself, I wept and wept and my cries were heard right throughout the village. “Aye, there cries the bone lazy daughter of the sow!” Tina, the village gossip cried out for the streets to hear while she washed whores’ stained sheets. I usually found Tina’s gossip spat out as she spun that wooden peg dolly entertaining; it made it easier to get a day’s work done when you had stories to stop and listen to. This time, though, I was annoyed because the story was about me. I was just about to crane my neck out the window and hurl insults at Tina and tell her to shut up when I noticed Mistress Anna Furba, the local Squire’s mother, passing by on her return from the King’s estate. She adored Tina’s gossip and paid in gold coins for every tale told. Re-telling Tina’s tales made Mistress Furba popular in the boring courts of the King where women longed to be entertained with stories embellished from a banal truth. I was about to scream out that if she was going to be telling my story, then I wanted some of that gold but decided to listen first. “How much will you pay me for such a tale?” Her arms were elbow high in soapy water and her face red from vigorous scrubbing. Mistress Furba sighed. “Give me the gold coin back if this is all you can give me.” She plunged her hands down the abyss that was Tina’s cleavage but the washerwoman leaned back, clutching her chest. Now my mother had not heard the conversation between Tina and the gentle lady but she did hear me and thought I was admitting to my lazy ways. She came to my room holding the reed brush and said, “Aye, you cannot–but a few more beatings will change your way of thinking.” I strained to hear the rest of the conversation while guarding my head with hands and howling as loudly as I could. Mother stopped to catch her breath and I rushed to the window to lean out and watch Tina and Mistress Furba. She had the most beautiful dress of green velvet trimmed with white fur–it made me forget about my stinging skin and aching back. Now to have a fine dress like that! Even though my mother had stopped beating me, I kept howling and crying and saw Mistress Furba’s face wince at the pained tone of my voice. “Yes, yes.” Mistress Furba threw another gold coin into the soapy water. But Mistress Furba didn’t hear the rest of Tina’s rhyme. Chin high, she strode towards the little cottage and rapped at the open front door while I sat wailing. My mother, who hated me crying for no reason, started to beat me again with her reed brush. “Now you’ve got something to cry about!” My mother said. “Stop beating that poor girl!” The lady walked through the door without invitation and stood over my mother. I stifled a smile. “My daughter is lazy! What would you do with her?” My mother had put the broom down, though, willing to listen. The prospect of marrying me off to the Squire of the village was too good an offer to refuse. My mother leaned closer to Mistress Furba and smiled as sweetly as she could, revealing her fetid gums and missing front tooth. Mistress Furba of course hadn’t thought about that. Tina’s tales were truth; well, she wanted them to be and that was enough to make things true. She’d also paid two gold coins to the washerwoman for the story. I gulped and my mother pinched me to be silent. I just stared at that green, velvet dress; its beauty was enough to silence me without the pinch. “Will I wear nice dresses like yours when I’m wedded?” I asked and fondled her skirt between my fingers. Its velvetiness made me tingle with delight. And I was sent to my fate: to spin or die. To be wedded or beheaded. I cried for three days. Locked in a room full of flax, a spinning wheel and treadle, I felt sorry for myself. Time was running out before Mistress Furba would have my head cut off and I wouldn’t get to marry into wealth and wear fine dresses and eat food that made a thin belly round. The thought of my head rolling off the block for her friends’ entertainment made me wail again and again; my cries were heard far and wide. “There cries, Clorinda, so lazy she cannot take this opportunity I have given her to spin flax and marry a noble man!” Tina lamented as she washed soiled linen. And this time, Tina’s laments were heard not by Mistress Furba, but three, lonely, old spinner crones, with no family but each other who lived across the square from Tina. Whir, whir, whir, was the only sound they usually heard because spinners they were. The whirs were drowned out by the sorrow in my wailing. And as they licked the thread, pressed the pedal and made sure the spindle was full of wound thread, a moment of weakness came over them. They stopped spinning and followed the cries to the back spinning quarters of Mistress Furba’s estate. “I’m Magdalena and these are my sisters, Mariuccia and Maria. What troubles you, girl?” The three crones asked. Their appearance frightened me: Magdalena with gargantuan lips, Mariuccia with a club foot and Maria with a gigantesque thumb. I huddled into a corner. Magdalena pressed her face against the window of my work-room. Her flabby lips conjured up images of the lips we hide beneath our skirts. Then, Mariuccia, hobbled over to join her at the window. “Well, would you rather a small dwarfish looking man came to your aid demanding your firstborn child instead?” She snapped at me. “It could be arranged!” Maria said and wiped the sweat of her cheek with her extra large thumb that made me look away. Red and erect, it looked like a male appendage. The three crones began to walk away muttering something about calling a little impish man instead when I yelled out to them, “Don’t go! The Mistress Furba thinks I can spin all this flax in this room in the next three days. If I do, I marry her son and become a Squire’s wife. If I don’t, I’ll be beheaded in this awful dress!” I cried. I fell to my knees and heaved so that the tears fell. When I looked up, I saw their expressions softened, Maria with tears in her eyes. I was a young girl with the same fate as their own: spin or die. I kissed her thumb in gratitude. It was difficult squeezing in Mariuccia but I managed to get all three of them into my work room. “We will spin all your flax, if you acknowledge us as your Aunties from this point on and, at your wedding, have us seated at your table as your guests of honour,” Magdalena said. I nodded my head. From now on, they would be my family; my mother could stay poor. I crossed my heart with Maria’s large thumb. Kissed Mariuccia’s club foot and Magdalena’s large lips. The deed was done. They whir, whir, whirred all through the night and spun all the flax into linen. I promised them that as my family, we would share the wealth that would come with my wedding. When Mistress Furba saw all the flax spun into linen, she was delighted and paid Tina five gold coins. True to her word, she had me marry her son (and sent for more flax to be delivered to my room). True to their word, Magdalena, Mariuccia and Maria came to my nuptials as my Aunties. True to my word, my Aunties sat next to me at the wedding celebrations. “Who are these vile women? My new husband asked me at the reception, shuddering at their appearance as they all took their places next to mine. “But Clorinda, how can a maiden as pretty as yourself, having created such fine threads for my mother…how can you be related to such deformed creatures?” He asked, perplexed. He kissed Mariuccia and Magdelena’s hand. As he raised Maria’s from under her silk shawl, he noticed the large red and erect thumb and dropped her hand hastily and kissed her face. “…Nice to…meet -Aunties,” he said, stumbling over his words. “Yes, Filippo. We thank you for the fine gifts you have given Clorinda’s relatives,” Maria answered him stroking his face with her large thumb. Maria interrupted leaning in close to his face. “And I got this large thumb from making sure the spindle is full of wound thread.” Maria showed off her appendage. “Enough, enough,” he said and wiped at his shoulder in case any of Magdalena’s dribble had reached him. I touched the velvet on my beautiful new frock and looked up at him and batted my long lashes at him. He kissed me on my forehead and walked towards his mother to tell her of my idle future. I caught Mariuccia’s attention and beckoned for her to follow me outside. She pinched Maria and Magdalena’s arms and they followed her out to the back of the barn where it smelled of dung and hay. “I will never have to spin again!” I squealed. “Praise for old wives’ tales!” Mariuccia whispered and threw a pistachio in the air and caught it in her mouth. Maria chuckled and hit me playfully on the arm. That night I danced in my beautiful cream coloured velvet dress, embroidered with gold thread and as I danced with my new husband, I choreographed my future. I looked over Filippo’s shoulder and winked at my Aunties. I knew that spinning a yarn saved more women’s lives than spinning flax into linen. Angela Rega is a belly-dancing high school librarian with a passion for folklore, fairy tales and furry creatures. A graduate of the Clarion South Workshop, Angie’s short stories have appeared in Straying From the Path:New Tales of Little Red, Belong, Worlds Next Door and Cezanne’s Carrot. In more adventurous days, she lived in Chile, South America teaching English and belly dancing. 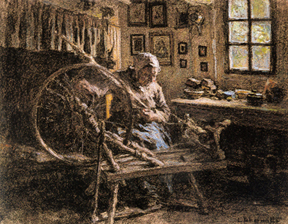 Image: The Spinning Wheel, Leon-Augustin L’hermitte (1841-1925).